Super Chick Sisters is an Adventure game on www.bestgames.pk. The object of the game is to rescue a VIP. There is a narrative about it. Colonel Sanders and his minions have kidnapped Pamela Anderson for revealing to the world that KFC’s secret recipe is cruelty to chickens. You should help the super chick sisters save Pam before it’s too late. Use the arrows to move. Press the up arrow to jump, climb and break blocks. You can kill enemies by jumping on their heads. There are two characters for selection, Nugget or Chickette. The terrorist in the game is a spider man with a KFC head. Don’t hit it, or you will lose a life. There are totally three lives for you. The more spider men you kill, the higher score you can get. Different stages have different adventure. Try to go as far as possible. Join now. The two sisters are going back to school today and they need your help. We do not want them to be late, join them right away! Start by finding the items they need for school - pencils, notebooks, pencil cases, lunch boxes...all the objects are somewhere in the room, you just have to look carefully. You will also have to help the girls with their outfits. Make sure they look perfect for school! Look for the cutest skirts and blouses. The girls also need glasses and purses. Since they are sisters, they can wear matching clothes. Have fun with them! 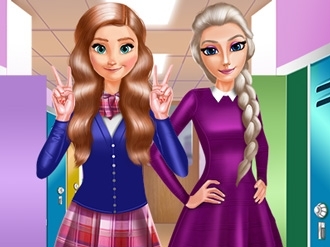 Come and meet the manga Frozen sisters Elsa, Anna and Rapunzel! They needs a fashion makeover and your suggestions would be great. Dress each princess up with these beautiful dresses and outfits. Match with cute accessories. have fun! The great sisters Anna and Elsa want to get the boys. 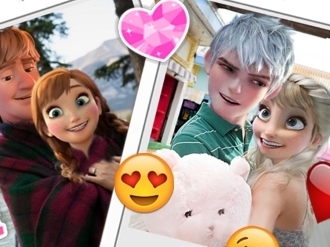 Kristoff and Jack have shared their fun ideas on Facebook and the girls want to follow them and take a few pictures to capture those moments. Can you help them in Sisters Love Pursuit? This is the first time frozen sisters Elsa and Anna are going to be bridesmaids, and they are really excited! The two beautiful princesses are best friends with Rapunzel, who is getting married this weekend. And being a bridesmaids is not so easy, as it seems! That’s why they’re asking you for a fashion advice. Choose the matching outfits, but don’t forget, that each sister has her own unique style! 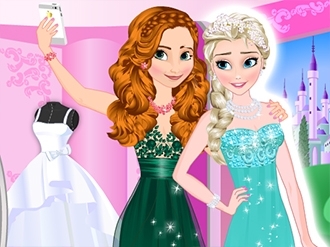 You can choose a floor length gown or a funny short one – both are going to look great on Frozen princesses. If you want to add a little sparkle to their look, you can accessorize with jewelry and bouquet of flowers! How about changing their hairstyle? There’s so many options! 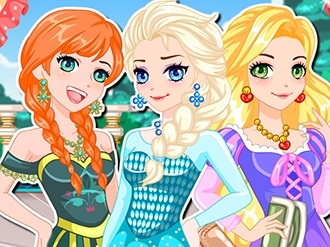 And at the end help princesses to make a perfect selfie! Make sure it will get lots of likes! Have fun, preparing Anna and Elsa for their BFF wedding day!